A tasty way to use up leftover chicken! Preheat oven to 450°F . In pot of boiling water, cook broccoli until tender, to your taste (or steam the broccoli). In 2 qt casserole dish, place cooked broccoli, add chicken. Pour prepared Dottie's Cream of Mushroom soup over chicken. Sprinkle with Monterey Jack or Cheddar cheese. 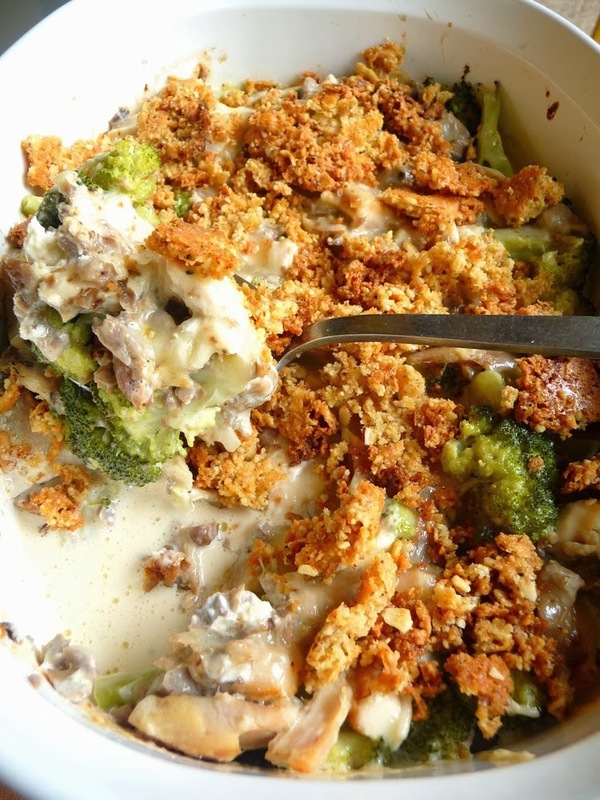 Prepare Crunchy Casserole Topping: In a small bowl, combine Monterey Jack Cheese, flour and butter. Spread in clumps in 9-inch glass pie dish. Place in oven along with Crunchy Casserole Topping in the pie dish. Bake 15 minutes, or until casserole is bubbly. The topping should be golden brown. 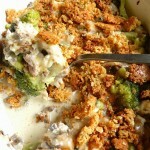 Keep an eye on the Crunchy Casserole Topping after 10 minutes, as it can turn too dark rather quickly. Break up the topping after it has cooled 5 minutes. Sprinkle the topping over the hot casserole and serve.